In FNE 58 (January, 2013) I explained about the trial installation of an Automatic Crossing Locally Monitored with Barriers (AOCL+B) at Ardrossan Harbour in June, 2012. As many of you will know, that trial was successful (identifying only minor modifications necessary) and Network Rail (NR) is in the process of installing AOCL+Bs at many of the 23 sites in Scotland. These will be completed by the end of the current 5-year Control Period (CP4) at the end of March, 2014. NR expects to continue the installation process in Scotland early in CP5 (which runs from 1st April, 2014 to 31st March, 2019). I went to see the first train across the newly-installed AOCL+B at Hoy (between Georgemas Junction and Thurso) on Sunday, 19th May, and took some photos, one of which is shown below. The process of installation is simple as there is no interface with the existing track or signalling - all that is required is the physical erection of a box full of electrical kit and the barrier mechanism itself. However, nothing on the railway is as straightforward as might be expected: the legal processes involved from the roads authority and the necessary notice needed by all parties in the rail industry about lineside work being carried out mean that up to 45 days' notice is required. From starting the planning to commissioning, the installation typically takes around 3 to 4 months. Planned commissioning days (all Sundays) for the AOCL+Bs on the FNL (in case you want to go and see them as a road-using member of the public) after 1st August are Bunchrew (18th August), Lairg (1st September), Dingwall (10th November and 1st December) and Brora (26th January, 2014). Others on the Kyle Line are also being installed in the coming 6 months. Not all FNL AOCLs are being upgraded in this way. NR is involved in the lengthy procedure required to close at least two - one to vehicles but remaining open for pedestrians, and perhaps two others completely. 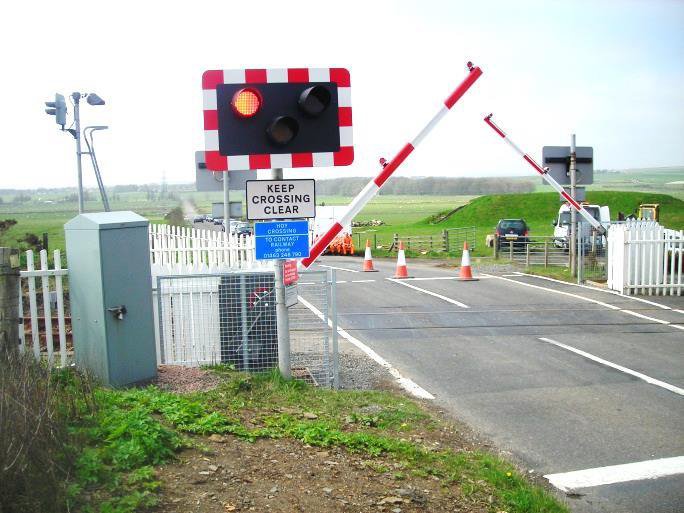 In all cases, there is an alternative crossing (by bridge or by level crossing (LX)) within 0.6 miles (1 kilometre). In two more cases, the upgrade will be to a higher (and considerably more expensive) type of LX - but, again, negotiations are taking place and further details are not publicly available. Halkirk will be upgraded to an Automatic Barrier Crossing Locally Monitored (ABCL) - as will Garve on the Kyle line, but I have seen no timetable for this. Nor have I any information about the continuing existence of the two open crossings at Rogart - where there is a 10 mph speed restriction for the train - and at Kildonan - where (for reasons lost in the mists of time) the train must come to a stand before proceeding. Elimination of these by NR would go some way to persuading long-suffering users of the FNL that reducing journey times (increased by 20 minutes or more in 2004) is something they take seriously. Some time ago, I understand there was a suggestion made to NR that Kildonan should become a User Worked Crossing (UWC), like a farm crossing, since the principal use was by the Estate for stalking, but this seems to have come to nothing. South of Inverness there are things going on in LX-land as well. The good folk of Kirknewton (south-west of Edinburgh on the Shotts and Carstairs line) are not happy about the plans to deal with the increase in rail speeds and traffic at their LX. Because of the increased risk, NR is required to install barriers that will interrupt road use for "too long". Attempts to divert the road to allow the construction of a bridge have run into insuperable obstacles (land take and cost not least) and it looks as though the locals will have to put up with it. Curiously, however, it turns out that the locals' biggest objection is to the interruption to road use whilst the work is being done. The main complainers about barrier down-time seem to be non-locals using the B7031 as a rat-run, and the locals see the rat-runners being made unhappy as A Good Thing. The new barrier will be a Manually Controlled Barrier with Obstacle Detection (MCB-OD), the first new type of LX since the Automatic Half-Barrier (AHB) was introduced nearly 50 years ago. The OD is the cunning bit. There are two detectors. One is a radar device to pick up vehicles or pedestrians (as used on the Continent for many years). NR has introduced a second laser detector at virtually ground level to detect a pedestrian lying down (drunk or otherwise), or a child or an obstacle like a suitcase (which nowadays might not be innocent). If either detector senses an obstruction, the barrier will not fall (or if it has fallen, will rise again), and the train will not see a white "OK to go" light. Trials in East Anglia found that hedgehogs were sufficiently bulky to be detected, so tweaks were made and now hedgehogs have to fend for themselves. Raising the laser by a few inches also meant that the sensitive lenses were less likely to become blocked by spray and general roadside muck. Some of them have also been fitted with moveable shields to keep mud off the lenses but this introduces a moveable part that will always be prone to failure. We should expect to see MCB-ODs being installed to replace LXs (of whatever type) where obstacle detection is currently being done by CCTV. Another exciting thing to look for if your journey takes you beyond the FNL! As Mike Lunan says above, we are not too sure which of the three LXs in Dingwall are to be converted as we understand that Network Rail has applied for the closure of one of them. It has been reported that at least one other closure has been applied for.